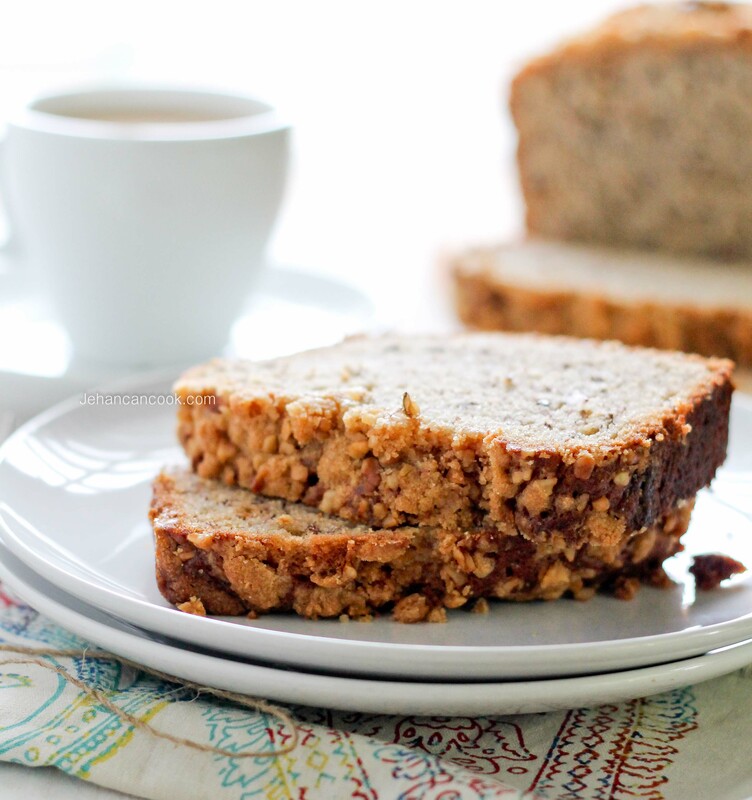 A quick bread made with bananas and walnuts and topped with a crunch walnut streusel. Fact: I do not eat bananas. I stopped eating bananas when I moved to the States and was introduced to the large bananas here – I hated them. I grew up eating what we call sweet fig bananas (not sure what variety it actually is); they are smaller than the common banana and super sweet so I found these larger bananas to be quite disappointing. The years rolled on and I decided to give it another try but by that time I had become not so fond of the texture. Strangely enough, while I don’t eat bananas, I still love the flavor and especially love it in desserts. 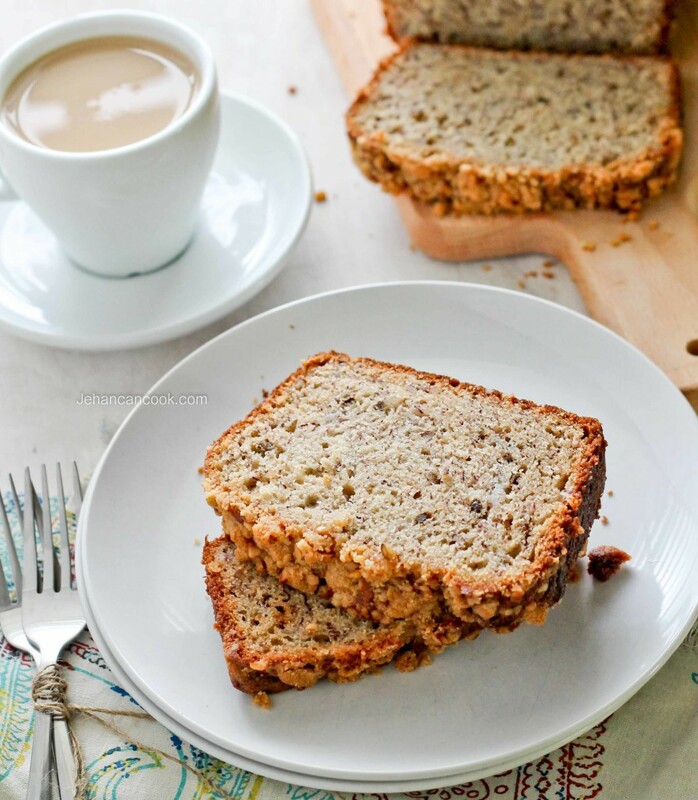 I’m a sucker for a good Banana Nut Bread so when I came across this 5 star recipe from Better Homes and Gardens, I knew I had to give it a try. I chose to add the walnut streusel because I love the contrast between the soft cake and crunchy nut topping. I followed the recipe as is (something I rarely do) and it was amazing! • Make sure to use overripe bananas. • Grease the pan only to about 1-1 ½ inch up. Allow the dough to cling to the sides create a dome in the center as it bakes. • Mix the wet and dry ingredients together with a spoon just until it’s combined. Do not over mix or it will cause large tunnel. 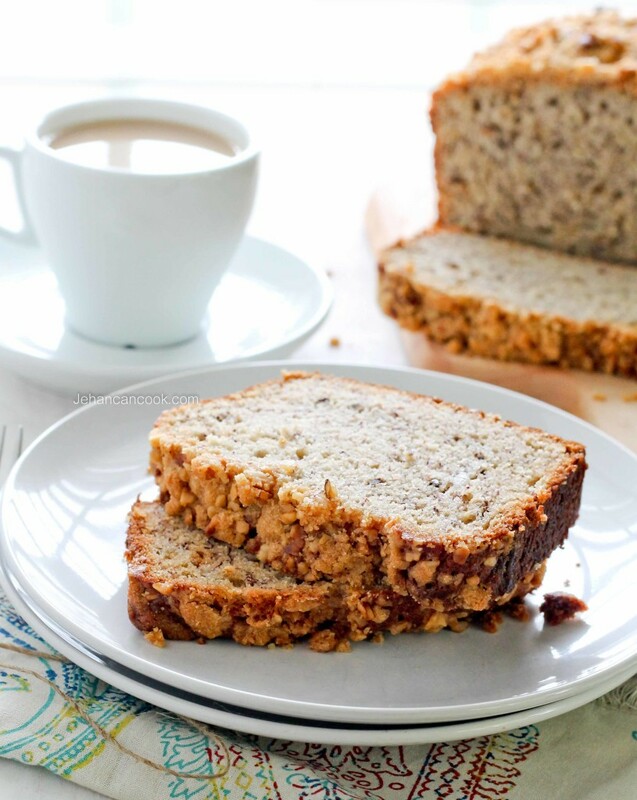 Now that we have a few tips, it’s time to make Banana Nut Bread! To make the Banana Nut Bread preheat oven to 350 degrees. Grease a 9x5x3 inch loaf pan and set aside. In a large bowl combine flour, baking powder, baking soda, cinnamon, salt, nutmeg and ginger. In a separate bowl combine eggs, banana, sugar and oil. Pour into the flour mixture and using a wooden spoon, mix until just combined. There will be a few lumps, but it should only be lumps of banana. Fold in walnuts and pour into the loaf pan making sure to spread evenly. Evenly distribute the streusel topping over the batter. Place into preheated oven and bake for 55-60 minutes. The top should form a dome which springs back when gently pressed. Cool on a wire rack for 10 minutes before removing from the pan. Cool completely then wrap and store overnight before cutting. To make the Streusel Topping: Add flour and brown sugar in a small bowl and stir to combine. Cut butter into flour until it resembles fine crumbs. I simply used my finger to quickly rub the butter into the flour, you can also use a pastry cutter or knife, but I’ve found this to be the quickest method. Next add nuts and stir to combine. This is seriously one absolutely beautiful bread my dear. Gorgeous!